So sorry I'm posting late. I wasn't actually planning to post until tomorrow; but I have a few minutes of free time so I thought I'd go ahead. On Friday I took my 40% off coupon to Michael's and purchased a new Martha Stewart Scoring board. Of course I had to use it right away and I thought the perfect project would be this "folded paper frame" card. This was a lot of fun to do except that I forgot to use dimensional adhesives on the frame parts, so my frame is a bit flat; but oh well. Note to self next time, right? Anyhow, my card measures 5 1/4 x 5 1/4. I used Artichoke, Sahara Sand, Mellow Moss and Brocade Blue. The pattern paper for my paper frame is a piece from Chatterbox "Den" Collection. I think this set retired eons ago; but I still have some so why not use it, right? The typewriter in the middle is from SU's "Puns from the Past." The sentiment at the bottom is from SU's chitchat rubons. 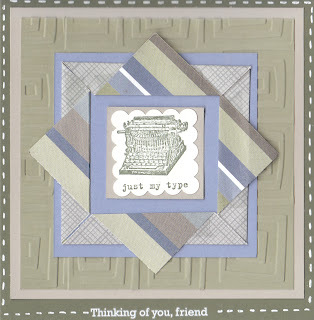 I used "traffic jam" cuttlebug embossing folder on the mellow moss square piece. Ok, a short post today; but I hope you like it. I'll see you all tomorrow! This is great!! Hope you have fun w/ the new scoring board. I might have to think of getting one soon!! Jealous of your scoring board! The card turned out great! Great masculine card! Thanks so much for trying out the tutorial!